A game in which groups composed of 3-5 (wo)men are solving riddles and ciphers in order to find the secret CEQIP password. The solution of each cipher points to the position of the next cipher (so expect also a short walk in dark night). Participants will be provided with all the necessary equipment and details before, or during the game. 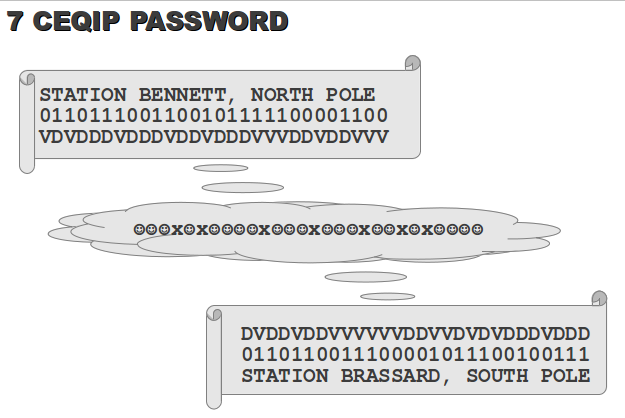 The SECURITY of CEQIP password was the solution the puzzle on the right. Below is the list of participating teams and their performance. Congratulations to members of the winning team of WINNERS. And thanks all for enjoying the game. 22:25 22:35 22:44 22:58 23:00 23:13 ??:?? ??:? ?